TEAM THOMAS ON KVAL NEWS! Become a FAN! We are all born with different gifts in this life, and we believe we are called to use them to the fullest! 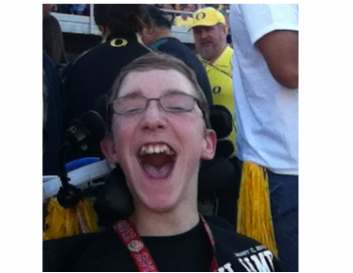 Thomas was born with cerebral palsy and needs 24 hour care. He was also born with a gift of enthusiasm!, and a deep desire to live his life to the utmost. In doing so he naturally inspires others to do the same. That is the main goal of Team Thomas: that no matter what you ability or level support needed, lift each other up and enjoy living life in the process. 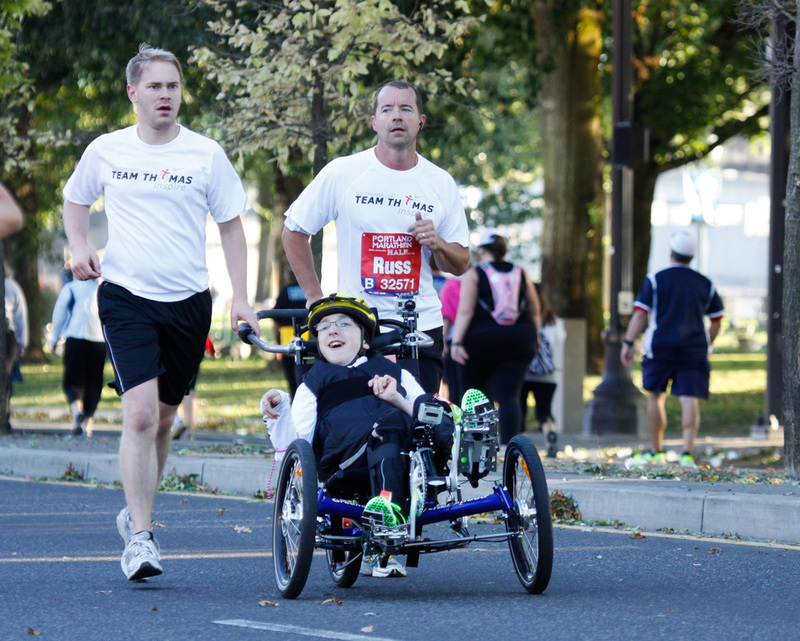 Join with us and support Team Thomas as we seek to inspire others today! Pics from Team Thomas' first event! 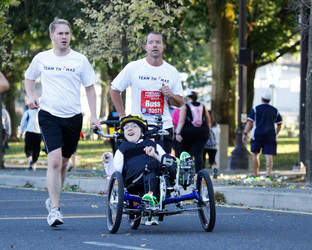 Team Thomas began with a dad and his son Thomas who was born with Cerebral Palsy, who want to inspire people of all abilities to live their lives to the fullest! As Thomas's parents, we have always encouraged him to participate as much as possible, by trying our best to "figure out how he can..." instead of telling him that "he can't". One day his young cousin unbuckled his wheelchair and pulled him out, just wanted to play with him! He asked why he couldn't play like the other kids, we told told him that he can do most things others can do he just needs more help. We all need help of varying degrees, he just needs more physical help than others. Not wanting him to miss out on the things that I love I began to think of ways to include him. When he was younger, I rigged up a harness to strap him to the back of me while I took him for a ride on my motorcycle. When he got too big to climb on with him on my back we figured out a sidecar would be a great way for him to participate in the thrill of motorcycling! We were able to use the same harness to strap him to my back as we climbed up Diamond head while vacationing in Hawaii. The picture shows the typical Thomas reaction and general enthusiasm he has for life. I began to realize that he was getting heavier, and I was getting older. This realization renewed my desire to stay fit enough to lift him for many years to come, so I began running and hitting the gym regularly. 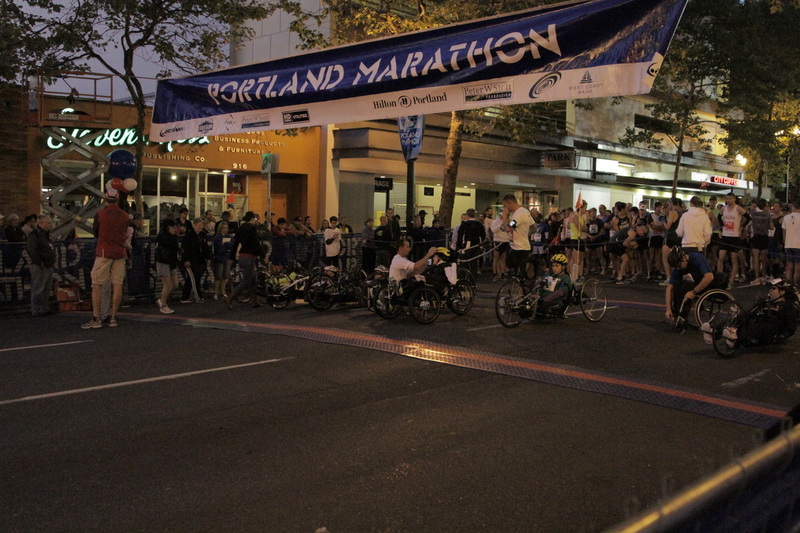 In 2011 I completed my first marathon. It wasn't long before Thomas was saying, "I want to do that with you Dad!" He had outgrown his jogger stroller so I began to search for something that could be adapted to his positioning needs but would be able to steer and run with it as well. 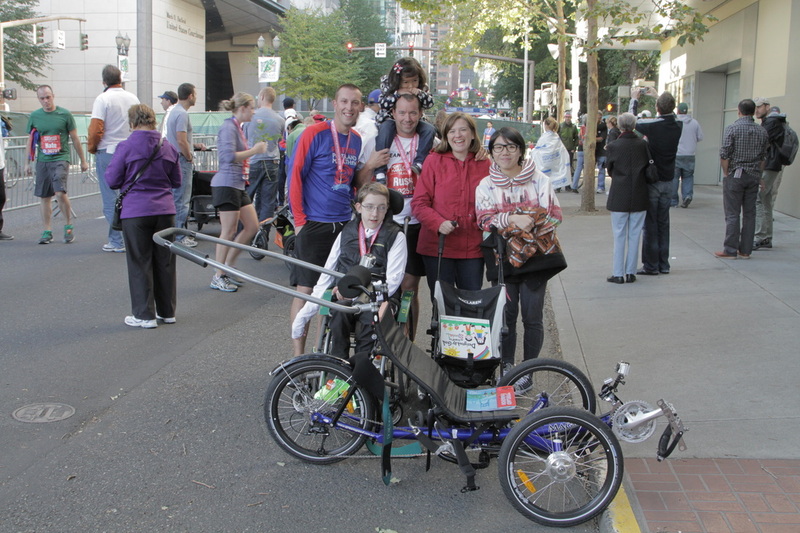 This summer we settled on a recumbent trike, to which we added some adaptive equipment and some custom parts (thanks to Uncle Mike at MWH fabrication) and we are ready for our first race. 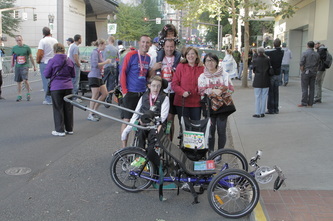 When I took Thomas to get my race packet for the 2012 Eugene Marathon, we ran into our friend Laurel. Thomas told her he was going to do the next one, to which she quickly replied, " I want to run with you too!" And that was the beginning of "Team Thomas". We have several runners all ready to join us for the first event, and several others who want to train for some in the future. 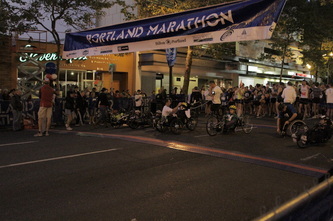 The inaugeral event will be the Portland Half marathon on Oct 7th, 2012. We anticipate a couple events a year.